MyProxy is an open source software and part of the Globus toolkit. It provides functionalities to manage X.509 Public Key Infrastructure (PKI) security credentials. It is an online repository that allows users to store their X.509 PKI security credentials. Each credential is protected by a password that is provided by the user at the time of storage. The credential can be retrieved later from the repository for use. The advantage of this method is that users don't have to carry their private keys and certificates to install on computers which they would like to access grid resources from. This is especially userful for users who have to use shared computers and are thus unwilling to save a copy of their grid certificates on those computers. For more information about MyProxy, please refer to http://grid.ncsa.uiuc.edu/myproxy. Please note that the service is also available on port 80, in case the client's network provider filters connections to high ports (above 1024). The user will be prompted to enter first his/her grid certificate passphrase. As a consequence, a credential/proxy is generated. User will be prompted to enter another passphrase, the so called MyProxy passphrase. This is the passphrase that will protect the user's credential on the myproxy server. Even if the lifetime of the proxy just created is limited (by default 7 days, usually much less than the original user certificate), all criteria to devise a secure password should be applied here as well. The MyProxy passhrase should be entered twice, the second time for verification. For more information regarding creating credential with varying lifetime, please use "myproxy-init -help"
If you are going to use the Java webstart based GSISSH-Term you can use its builtin functionality to retrieve a proxy from a MyProxy server. See GSISSH-Term page for all the details. The user will be prompted to enter his/her MyProxy passphrase for verification. User will be prompted to enter his/her MyProxy passphrase for verification. If you face any problems, please contact grid-admin@lists.lrz.de. 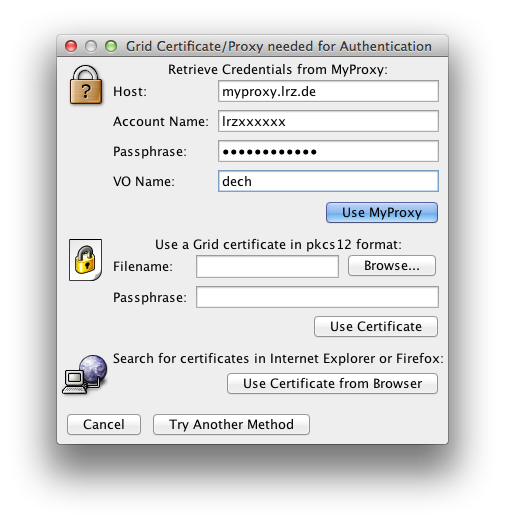 The LRZ MyProxy can issue a proxy certificate with VOMS extensions. This comes very handy as it saves users the trouble to install and configure VOMS utilities on their local platform. Simply uploading a regular (non VOMS) credential to MyProxy, it is possible to retrieve a proxy with a VO attribute. MyProxy is connecting to the VOMS server, performing all the necessary negotiations and checks on behalf of the user. The procedure is successfull if the VO is supported by LRZ. At the moment, the LRZ MyProxy works with all EGI VOs. Of course, the user should have previously registered his certificate's DN with the VOMS server, that is to say the user should be a member of the VO he wants to use. For more details, or to check that your VO is recognized, please contact grid-support@lists.lrz.de. at the moment of requesting a credential, use the -m flag, i.e., typing myproxy-logon -s myproxy.lrz.de -p 7512 -m <your VO>, for example myproxy-logon -s myproxy.lrz.de -p 7512 -m esr. You can easily verify the extensions by means of the voms-proxy-info --all command. This feature has also been imported in GSISSH-Term: just specify your VO in the VO Name field when you try to connect to a resource using the MyProxy dialogue box (in the following picture, where the user is asking MyProxy to get a VO extension from the dech VO). in order to use your certificate at LRZ, your DN should be registered and known to us. Instructions on how to identify the DN are given later on in this section. The identity field contains the DN to add to your account in the LRZ ID portal. In order to extend the life span of your credential, use the -t option of myproxy-logon, specifying the number of hours, up to 500. If you already uploaded a certificate using your username, then this will not work. You have to remove the old credential typing myproxy-destroy -s myproxy.lrz.de -p 7512 -l <your LRZ username>. The same functionality is also available if you access the LRZ MyProxy service by means of GSISSH-Term: just specify your LRZ username and passphrase in the corresponding fields. If you need to fetch the certificate DN, click on Proxy in the menu bar on top, and then choose Proxy Info to visualize the subject.